Questions to a painting: A portrait or a still life? Is it still a portrait or already a still life? Reminiscence of life, proof of human existence, or merely an object, a bone, Vanitas, end, nothing more. ‘What I see really existed,’ could be said when looking at a skull, but what I see does not exist any more. What’s left is an empty skull, stripped of skin, countenance, ugliness or beauty, the thoughts hidden inside, feelings and memories, stripped of all the story that happened under the tough bone and of any individuality. And now you can only be afraid as the skull means fear. The obsession of one’s own survival triggers in man, often to the detriment of his life, the stubbornly recurring anxiety about saving one’s own individuality also after death. Thus, fear of death is an experience, a feeling or an awareness of forfeiting one’s individuality, a vehement experience, suffering, fright, anxiety. 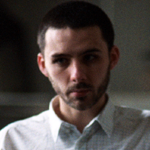 It’s a feeling of a certain break, evil, failure, i.e. it’s a traumatic experience. A realisation of certain void, nothingness, which opens where there used to be individual abundance, so it is a traumatic realisation. In the past, nothing was left after a man’s death, nowadays there is his data in the cloud and on the hard drive, his mobile number that his family keeps as if the active number meant ‘he is still here, with us’. These days, death has undergone such a far-reaching medicalisation that dying may seem to be a completely unreal process, occurring in sterile white hospital rooms, the custom of wearing unadorned black clothing has disappeared, the mourning itself is supposed to be discreet, and the skull has become more of a fashion statement studded with Swarovski diamonds. In such circumstances, the return to the motif of Vanitas is a true challenge, from an artistic and social point of view. Łukasz Huculak approaches the theme in a very serious manner and does not reduce the skull merely to the role of still life. 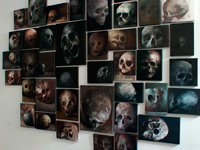 His paintings with the skull theme stem from his personal experience, deep reflections on fundamental topics. 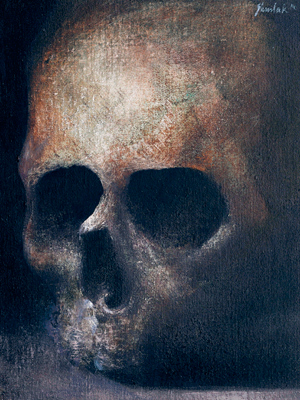 At the same time, the skull is an aesthetic object – its greyness, texture, shape and the layout of ajours is the subject of the painter’s exploration. For a long time, he believed that the gravity of a skull – this crown of still life – is inevitably suffused with grotesque. For years he would treat painting skulls as a painter’s training, almost meditational. Until the motif grew in strength and the painting reached the appropriate state of matter. The existential burden and the chill of constructivism merged into a painting. Following the series of his narrative paintings, the artists consciously returns to single-object representations of sharpened contrasts, to paintings which can be viewed as a whole in a split second, the one-glance paintings. For the painter and his audience, these paintings are, at the same time, like entering the darkness. Regardless of, or perhaps depending on the motif, his palette has gone darker, but the darkness is replete with a variety of velvety nuances, smooth transitions from darker to brighter tones. Naturally, one could write about the dialogue with painting tradition, about the meaning of the skull in the history of art. The artistic virtues of Łukasz Huculak’s paintings are evident and require no explanation. The interest in the motif of the skull can be explained by quoting Roland Barthes: After all, death must have its place in society . Barthes pointed here to the role of photography, while Huculak’s medium is painting. And the evangelical question returns: Do you have eyes but fail to see? (Mark 8:18).